Emerje wrote: Anyway, great read. Seems strange that they passed on a massive Titan Class repaint for $400 when smaller box sets were quickly approaching that price. Seems like a steal for a BotCon set that big. From the way they were talking about why they didn't do the Titan class stuff or the Grand Max reissue, while they didn't state it outright, the vibe I got from their tones and reasons was that those offers were suggested to Fun Pub not as BotCon boxed sets but as ordinary Club exclusives, like those that were sold in the Club Store and such, which would have definitely been out of Fun Pub's league, especially considering how people were already wincing (and still do to this day) at having to pay $100-$150 for just the normal Hasbro retail versions, and about $200-$250 for the Takara versions, of Titan class figures. EDIT: Actually, you know what? I can just go ask Jesse himself about this and see what's what rather than trying to guess what he and Pete meant. I'll see if he might have an answer. The Devastators were mentioned while BotCon brainstorming was taking place. So while not technically specifically mentioned for BotCon, heavily implied. As for the $400, that's where the toys themselves would have been starting. Before adding on the dinner, admission, etc. that went into bumping the BotCon price past the price of just the figures. So $400 would have been about the base price of just the figure set before the rest of the convention's offerings would have been added on, making the total Primus Package price go well over $400, whereas the most expensive Primus Package (in 2015) totaled out at $409 for club members. It is a shame we didnt get Sideswipe, I think that was one we were kinda counting on FunPub for. Speaking of, I really wanted those Autotroopers and X Brawn. I had actually looked at the Rook mold and womdered if we coulda gotten an Ironfist out of it. Guess I was right. Flashwave wrote: It is a shame we didnt get Sideswipe, I think that was one we were kinda counting on FunPub for. I wonder what would have been preferable: a badly executed retool, or a wonderfully done redeco. You forget, the Gen. Arcee mold has two styles of hands: the slot kind from the original release, and the 5mm-compatible one from the Combiner Hunters set. It does raise the question which would have been used. In this case, they likely would have tried for the 5mm Combiner Hunters hands. RoboCon 2019 Pre-Registration is now open! Any questions, feel free to drop us a line. We will be making the full announcement on social media tomorrow but we wanted to let everyone who has supported us through the first two years know before that! Hope to see you all at RoboCon 2019! 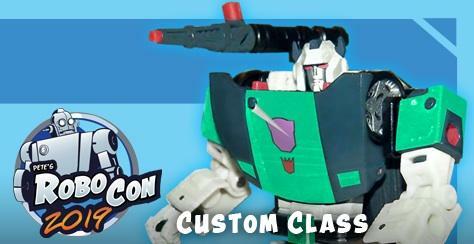 This years custom class toy will be Shattered Glass Sideswipe made from the Siege for Cybertron Sideswipe. The class will run from 5pm-10pm Friday evening. Class spots are limited. Bring him along. The more then merrier. In all seriousness, me and my own dad have been treating BotCon (and now RoboCon) weekend trips as father-son vacations since 2010. While I'm at the con he goes sightseeing, meets up with old friends, or goes to local ballgames. Then we do stuff together when I'm not at the con. Last year, for instance, we spent the day before RoboCon together at a local museum. See, I would love to, but there is an annual thing we go and spend all day Saturday at, unless there actually is more to see on Friday and then the custom class is Friday night, and then Saturday is the 2nd wrap up day? D-Maximal_Primal wrote: See, I would love to, but there is an annual thing we go and spend all day Saturday at, unless there actually is more to see on Friday and then the custom class is Friday night, and then Saturday is the 2nd wrap up day? The way RoboCon has been the past two years is that the first night is merely a prelude for the second day, which is the main event of the con. 2017 was a Friday-Saturday con while last year was a Saturday-Sunday con. This year's going back to being Friday-Saturday, but will likely follow in suit with the second day being the big day. Though, last year was the first year of the custom class, and IIRC there were two classes on the first day, which ran during the day. By the classes' end, the proper evening events began, which were pre-registration package pick-up, the meet-and-greet dinner, and a private preview of the exhibitor room. The second day's events ran all day from morning to evening. 2017 was the same with two differences for the first day. 1) The lack of custom classes meant that pre-registration package pick-up was the first event, with nothing happening during the day. And 2) after the meet-and-greet dinner was the private screening of TLK at the local AMC theater, which was then followed by the exhibitor room private preview. Hmm, I want to go, and if I could just go Friday, that would be better. Unfortunately it's a 5 hour drive it looks like, I thought it was closer to me. Darn. Given the source, very much made up. Anything from that site should be taken with the biggest grain of salt one can find. Still, I'd like to know what exactly happened. Not saying it's all phony, but it could very well have been a scam pulled by someone posing as the real deal. From what I know first hand, having attended both RoboCons thus far, at no point were any of the custom toys from either convention (2017's raffle prize and 2018's custom class toys) ever claimed to be officially sanctioned by Hasbro. Pete and Jesse even described at length how the process of actually getting the official license from Hasbro for any future RoboCon exclusives would be something that would take much time to happen, if they were ever even to attempt such a feat since it sounded like there was little interest in their trying to get Hasbro's license. Regardless, they fully and openly acknowledged that RoboCon and all its offerings are unofficial and done solely for the fun incentive of the event, completely unaffiliated with Hasbro in any official capacity. Nor does TFWiki acknowledge any of the RoboCon customs as official Hasbro product. The 2017 customs are only listed on the BotCon article as concepts that were never officially realized. Debatable, they've been wrong many times of course but they've also been right about a lot of things. I'm not saying they are right here, but given what the TFWiki cabal are like, it really, really wouldn't surprise me. That is also possible. The problem is, if it IS real, then the perps (being as they are in total control of the wiki and a sizeable online community) can just scrub the evidence and claim it never happened. Again, not saying this is absolutely real, but unfortunately I've become so jaded with that particular portion of the fandom that it wouldn't surprise me if they had done all that plus thrown a few puppies down a well for good measure. Sabrblade wrote: From what I know first hand, having attended both RoboCons thus far, at no point were any of the custom toys from either convention (2017's raffle prize and 2018's custom class toys) ever claimed to be officially sanctioned by Hasbro. In a nutshell, anyone saying that those custom toys are official Hasbro toys has his pants on fire In that aspect, RoboCon is like DairyCon, only a lot less silly and more lactose intolerant. Black Hat wrote: That is also possible. The problem is, if it IS real, then the perps (being as they are in total control of the wiki and a sizeable online community) can just scrub the evidence and claim it never happened. I never suggested TFWiki was responsible (they cant truly erase everything except from a database backup as every article has a change log), but anyone posing as either them or Pete could be a culprit. Again, I'd like some finer details of how this story came to be before we can properly start pointing fingers. 3,707 pages were recently viewed by 545 unique visitors. This page was viewed 1 times on Thursday, April 18th 2019 5:40am CDT. © 2019 Seibertron, Inc. DBA Seibertron.com. All Rights Reserved. Established June 2000. Seibertron.com is owned by Ryan Yzquierdo.